What is the difference between a reflex action and walking? A reflex action is a rapid, automatic response to a stimulus. It does not involve any thinking. For example, we close our eyes immediately when the bright light is focused. Walking, on the other hand, is a voluntary action. It is under our conscious control. What happens at the synapse between two neurons? A very small gap that occurs between the last portion of axon of one neuron and the dendron of the other neuron is known as a synapse. It acts as a one way valve to transmit impulses in one direction only. This uni-direction transfer of impulses occurs as the chemicals are produced in only one side of the neuron i.e., the axon’s side. 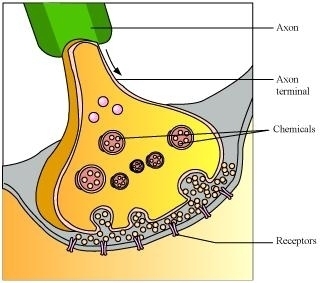 From axon, the impulses travel across the synapse to the dendron of the other neuron. Which part of the brain maintains posture and equilibrium of the body? Cerebellum, a part of hindbrain is responsible for maintaining posture and equilibrium of the body. How do we detect the smell of an agarbatti (incense stick)? The thinking part of our brain is the forebrain. It has separate areas that are specialized for hearing, smelling, sight, taste, touch, etc. The forebrain also has regions that collect information or impulses from the various receptors. When the smell of an incense stick reaches us, our forebrain detects it. Then, the forebrain interprets it by putting it together with the information received from other receptors and also with the information already stored in the brain. What is the role of the brain in reflex action? Reflex actions are sudden responses, which do not involve any thinking. For example, when we touch a hot object, we withdraw our hand immediately without thinking as thinking may take time which would be enough to get us burnt. The sensory nerves that detect the heat are connected to the nerves that move the muscles of the hand. 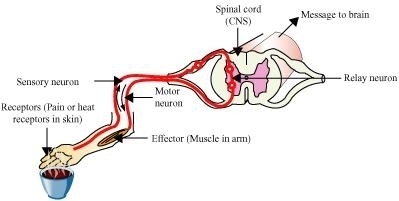 Such a connection of detecting the signal from the nerves (input) and responding to it quickly (output) is called a reflex arc. The reflex arcs −connections present between the input and output nerves − meet in a bundle in the spinal cord. Reflex arcs are formed in the spinal cord and the information (input) reaches the brain. The brain is only aware of the signal and the response that has taken place. However, the brain has no role to play in the creation of the response. Plant hormones or phytohormones arenaturally-occurring organic substances. These are synthesized in one part of the plant body (in minute quantities) and are translocated to other parts when required. The five major types of phytohormones are auxins, gibberellins, cytokinins, abscisic acid, and ethylene. How is the movement of leaves of the sensitive plant different from the movement of a shoot towards light? The movement of leaves of the sensitive plant, Mimosa pudica or “touch me not”, occurs in response to touch or contact stimuli. This movement is independent of growth. The movement of shoot towards light is known as phototropism. This type of movement is directional and is growth dependent. Give an example of a plant hormone that promotes growth. Auxin is an example of growth-promoting plant hormone. How do auxins promote the growth of a tendril around a support? Auxin is synthesized at the shoot tip. It helps the cell grow longer. When a tendril comes in contact with a support, auxin stimulates faster growth of the cells on the opposite side, so that the tendril forms a coil around the support. This makes the tendrils appear as a watch spring. Design an experiment to demonstrate hydrotropism. Take two small beakers and label them as A and B. Fill beaker A with water. Now make a cylindrical-shaped roll from a filter paper and keep it as a bridge between beaker A and beaker B, as shown in the figure. Attach few germinating seeds in the middle of the filter paper bridge. Now, cover the entire set-up with a transparent plastic container so that the moisture is retained. The roots of the germinating seeds will grow towards beaker A. This experiment demonstrates the phenomenon of hydrotropism. How does chemical coordination take place in animals? Chemical coordination takes place in animals with the help of hormones.Hormone is the chemical messenger that regulates the physiological processes in living organisms. It is secreted by glands. The regulation of physiological processes, and control and coordination by hormones comes under the endocrine system. The nervous system along with the endocrine system in our body controls and coordinates the physiological processes. Why is the use of iodised salt advisable? Iodine stimulates the thyroid gland to produce thyroxin hormone. It regulates carbohydrate, fat, and protein metabolism in our body. Deficiency of this hormone results in the enlargement of the thyroid gland. This can lead to goitre, a disease characterized by swollen neck. Therefore, iodised salt is advised for normal functioning of the thyroid gland. How does our body respond when adrenaline is secreted into the blood? Adrenalin is a hormone secreted by the adrenal glands in case of any danger or emergency or any kinds of stress. It is secreted directly into the blood and is transported to different parts of the body. When secreted in large amounts, it speeds up the heartbeat and hence supplies more oxygen to the muscles. The breathing rate also increases due to contractions of diaphragm and rib muscles. It also increases the blood pressure. All these responses enable the body to deal with any stress or emergency. Why are some patients of diabetes treated by giving injections of insulin? Diabetes is a disease in which the level of sugar in the blood is too high. Insulin, a hormone secreted by the pancreas, helps in regulating the blood sugar levels. This is the reason why diabetic patients are treated by giving injections of insulin. Which of the following is a plant hormone? (d) Cytokinin is a plant hormone. (b) The gap between two neurons is called a synapse. (b) regulating the heart beat. (d) The brain is responsible for thinking, regulating the heart beat and balancing the body. What is the function of receptors in our body? Think of situations where receptors do not work properly. What problems are likely to arise? Receptors are sensory structures (organs/tissues or cells) present all over the body. The receptors are either grouped in case of eye or ear, or scattered in case of skin. (i) They sense the external stimuli such as heat or pain. (ii) They also trigger an impulse in the sensory neuron which sends message to the spinal cord. When the receptors are damaged, the external stimuli transferring signals to the brain are not felt. For example, in the case of damaged receptors, if we accidentally touch any hot object, then our hands might get burnt as damaged receptors cannot perceive the external stimuli of heat and pain. Draw the structure of a neuron and explain its function. Neurons are the functional units of the nervous system. The three main parts of a neuron are axon, dendrite, and cell body. Axon: It conducts messages away from the cell body. 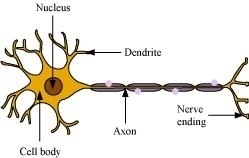 Dendrite: It receives information from axon of another cell and conducts the messages towards the cell body. Cell body: It contains nucleus, mitochondria, and other organelles. It is mainly concerned with the maintenance and growth. How does phototropism occur in plants? Thegrowth movement in plants in response to light stimulus is known as phototropism.The shoots show positive phototropism and the roots show negative phototropism. This means that the shoots bend towards the source of light whereas the roots bend away from the light source. (a) The flower head of sunflower is positively phototropic and hence it moves from east to west along with the sun. (b) The ovary stalk of groundnut is positively phototropic before fertilization and becomes negatively phototropic after fertilization, so that the fruit is formed underground. Which signals will get disrupted in case of a spinal cord injury? The reflex arc connections between the input and output nerves meet in a bundle in the spinal cord. In fact, nerves from all over the body meet in a bundle in the spinal cord on their way to the brain. In case of any injury to the spinal cord, the signals coming from the nerves as well as the signals coming to the receptors will be disrupted. How does chemical coordination occur in plants? In animals, control and coordination occur with the help of nervous system. However, plants do not have a nervous system. Plants respond to stimuli by showing movements. The growth, development, and responses to the environment in plants is controlled and coordinated by a special class of chemical substances known as hormones. These hormones are produced in one part of the plant body and are translocated to other needy parts. For example, a hormone produced in roots is translocated to other parts when required. The five major types of phytohormone are auxins, gibberellins, cytokinins, abscisic acid, and ethylene. These phytohormones are either growth promoters (such as auxins, gibberellins, cytokinins, and ethylene) or growth inhibitors such as abscisic acid. What is the need for a system of control and coordination in an organism? The maintenance of the body functions in response to changes in the body by working together of various integrated body systems is known as coordination. All the movements that occur in response to stimuli are carefully coordinated and controlled. In animals, the control and coordination movements are provided by nervous and muscular systems. The nervous system sends messages to and away from the brain. The spinal cord plays an important role in the relay of messages. In the absence of this system of control and coordination, our body will not be able to function properly. For example, when we accidentally touch a hot utensil, we immediately withdraw our hand. In the absence of nerve transmission, we will not withdraw our hand and may get burnt. How are involuntary actions and reflex actions different from each other? Involuntary actions cannot be consciously controlled. For example, we cannot consciously control the movement of food in the alimentary canal. These actions are however directly under the control of the brain. On the other hand, the reflex actions such as closing of eyes immediately when bright light is focused show sudden response and do not involve any thinking. This means that unlike involuntary actions, the reflex actions are not under the control of brain. Compare and contrast nervous and hormonal mechanisms for control and coordination in animals. 1. The information is conveyed in the form of electric impulse. 1. The information is conveyed in the form of chemical messengers. 2. The axons and dendrites transmit the information through a coordinated effort. 2. The information is transmitted or transported through blood. 3. The flow of information is rapid and the response is quick. 3. The information travels slowly and the response is slow. 4. Its effects are short lived. 4. It has prolonged effects. What is the difference between the manner in which movement takes place in a sensitive plant and the movement in our legs? 1. The movementthat takes place in a sensitive plant such as Mimosa pudica occurs in response to touch (stimulus). 1. Movement in our legs is an example of voluntary actions. 2. For this movement, the information is transmitted from cell to cell by electro-chemical signals as plants do not have any specialised tissue for conduction of impulses. 2. The signal or messages for these actions are passed to the brain and hence are consciously controlled. 3. For this movement to occur, the plant cells change shape by changing the amount of water in them. 3. In animal muscle cells, some proteins are found which allow the movement to occur.